In order to spread the word about your charity or society to the widest audience, it pays to create a mobile app. If you’re intimidated by the idea of creating a smartphone and tablet app for your organization, don’t be. With appsbar, you can create and publish a high-quality app in a matter of minutes. We’ve made things even easier by creating an easy-to-use theme that’s specifically designed for charities, societies and similar organizations. The appsbar app builder couldn’t be easier to use, and it’s the number-one free DIY app builder on the Internet. The best part of all is that it’s totally free. One really unique thing about appsbar is that it’s an all-in-one app maker. 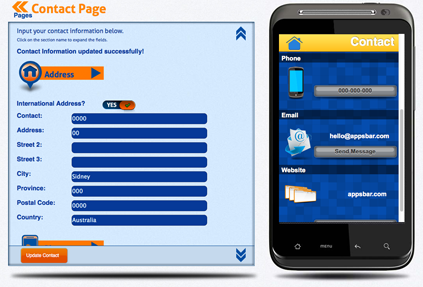 It’s an Android app builder, HTML5 app builder and web app builder all rolled into one. With our free Android app builder, anyone who uses an Android-based mobile device will be able to access your app and download it from Google Play. You can also create apps for operating systems that support HTML5, including iPhone, iPad, Blackberry and Windows Phone devices. This free app builder couldn’t be more versatile, and you can use it to promote awareness about your cause with ease. If you don’t already have a mobile version of your site, you’ll be happy to know that can be accomplished with appsbar. After completing your app, you will be given a simple string of code. From there, you just need to paste it into your website. When people access your site through their mobile devices, they will automatically be greeted with the app that you have created. If you’re wondering how to build an app, you’ll be happy to know that appsbar makes it an absolute snap. There’s no need to learn how to write complicated code or to do extensive amounts of research. appsbar is the best free app builder because it’s so intuitive and easy to use. Our quick and easy module for charities and societies can be used to make free web apps and create apps for all of today’s most popular mobile devices. You’ll be tickled when you discover how easy it is to make free mobile and tablet apps. As the only app builder that is really free to build and publish, appsbar is in a class by itself. If you’re ready to use our DIY app builder to create tablet apps and apps for other devices, you’ll be glad to know that we’ve done all of the prep-work for you. In fact, we have seven default pages that are especially designed for charities, societies and other organizations. You can stick with the following pages, switch them around or add more. With this versatile Android app maker, it’s all up to you. 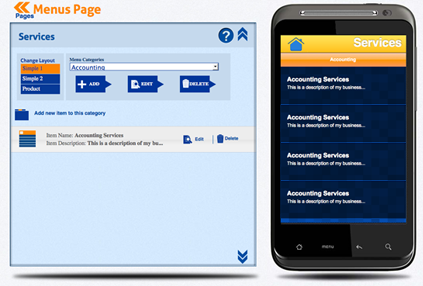 The default pages that are included in our free app builder are outlined below. This is where you can provide a basic summary of your organization. This free app maker allows you to include images and text, which makes it easy to get your point across. Include as much or as little information as you’d like. 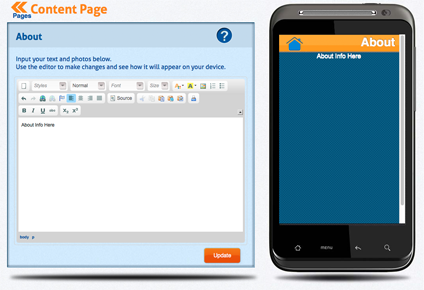 Your HTML5 cross platform apps and other apps will be formatted to include this information. To run a successful charity, society or other organization, you need to throw as many events as possible. From fundraisers to food drives, these events keep your organization running. 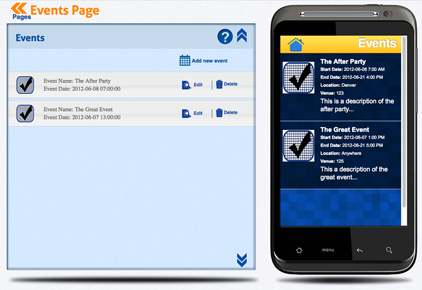 The HTML5 apps and other apps that you create with this free Android app builder can include a page that lists upcoming events. When people access your celebrity app, they will be able to quickly and easily tell which events are on the horizon. With the appsbar web app builder, you can create tablet apps and make apps that include information about the services that your organization provides. You can also create web apps that are cross platform. That’s good because it allows you to share information about your services to people who have many different kinds of devices. On this page, you can include descriptions, prices, images and other information. You can highlight the financial contributions that you make and the services that you donate. 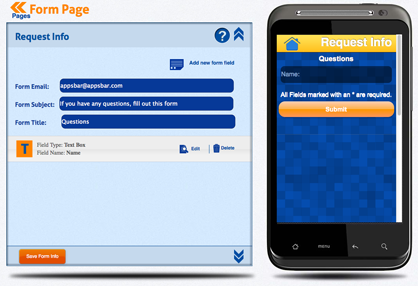 With appsbar, you can also make apps that let you specify the type of help that your organization needs. On this page, you can create forms. Information that’s gathered by these forms is sent to the email address of your choice. You’ll appreciate how easy it is to make free mobile and tablet apps that allow you to spread the word about the kind of help that you need. You may not know how to make an app, but appsbar does. The charity app that you create with appsbar, which is the best free app builder, will make it easier for people to get in touch with your organization. You can create web apps that are cross platform. HTML5 cross platform apps ensure that people with many different devices can connect with your organization. You don’t have to know how to build an app to use appsbar. Just fill in the requested information. 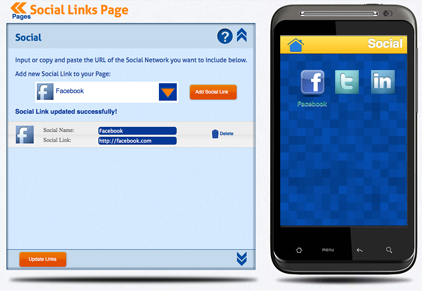 Use this section to include links to your charity’s social networking profiles. Building your list of followers will be faster and easier than ever! This section is required. You will be prompted to provide your organization’s address, telephone number, email address and website address. Put appsbar to work for your charity.